Supply Chain refers to the integration of all activities involved in the process of sourcing, procurement, conversion and logistics. On the other hand, value chain implies the series of business operations in which utility is added to the goods and services offered by the firm so as to enhance customer value. Supply Chain is the interconnection of all the functions that starts from the manufacturing of raw material into the finished product and ends when the product reaches the final customer. Value Chain, on the other hand, is a set of activities that focuses on creating or adding value to the product. These two networks help to provide quality products to the customer at a reasonable price. Most of the time supply chain is juxtaposed with the value chain. 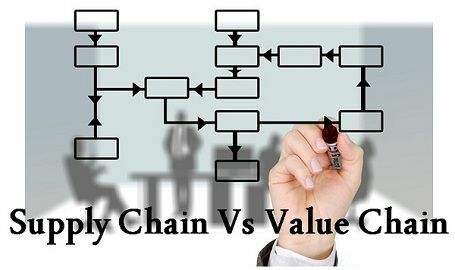 In this article, we have compiled all the substantial differences between supply chain and value chain. Have a look. Meaning The integration of all the activities involved in the procurement, conversion and logistics of the product is known as Supply Chain. Value Chain is defined as the series of activities, that adds value to the product. Supply Chain is a connection of all the parties, resources, businesses and activities involved in the marketing or distribution through which a product reaches the end user. It creates a link between the channel partners like suppliers, manufacturers, wholesalers, distributors, retailers, and the customer. To put simply, it encompasses the flow and storage of the raw material; semi-finished goods and the finished goods from point of origin to its final destination i.e. consumption. Value Chain refers to the range of activities that adds value at every single step in designing, producing, and delivering a quality product to the customer. 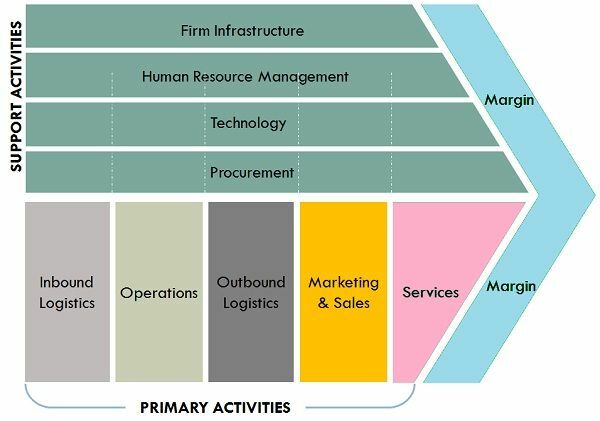 Value Chain Analysis is used to evaluate the activities within and around the organization and relating to its ability to provide value for money, goods, and services. Analyzing the value added in each activity and relating it to firm’s competitive strength. Inbound Logistics: It deals with receiving, storing and distributing of inputs. Manufacturing operations: Conversion of inputs into finished products. Outbound Logistics: It is concerned with the collection, storage, and distribution of product or service to customers. Marketing and Sales: Involve activities that create awareness among the general public regarding the product. Services: All those activities that increase the value of product or services. Support Activities: These activities help the primary activities and include procurement, technology development, human resource management and infrastructure. The integration of all the activities, persons, and business through which a product is transferred from one place to another is known as supply chain. Value Chain refers to a chain of activities that is indulged in adding value to the product in every single step till it reaches the final consumer. The concept of Supply Chain is originated from operational management, whereas value chain is derived from business management. Supply Chain activities include the transfer of material from one place to another. On the other hand, Value Chain is primarily concerned with providing value for price product or service. The order of supply chain begins with product request and ends when it reaches the customer. Unlike value chain, which begins with the customer’s request and ends with the product. The major objective of the supply chain is to gain complete customer satisfaction which is not with the case of the Value Chain. Supply Chain is described as a tool of business transformation, which minimizes costs and maximizes customer satisfaction by providing the right product at the right time at the right place and the right price. Conversely, Value Chain is a way of getting a competitive advantage, through which a company can beat its competitors along with fulfilling customer requirements. I find your analysis very helpful, excellent presentation, thank you immensely! very clear and helpful. thank you! Very interesting and good presentation. Thank you! thank u very much. it was really much useful. Very educative and easy to comprehend.